Yesterday I shared why we are moving away from a Boxed Curriculum and into a more Charlotte Mason/eclectic approach to homeschooling. Today I'd like to share the specifics of what we're going to use this coming fall. I don't like to rush on these decisions and by starting early it gives me plenty of time to pray, think through different options, scour curriculum catalogs and make a final decision so that I'm ready to actually do my purchasing in early spring. This works well for me because I like to take the summer off from major school work and planning. While we do keep up with reading and math a few days a week, I want to focus my time and energy during the warmer months of summer on field trips, pool days, water balloons, picnics in the backyard, hikes in the woods and just letting the kids have mental white space in their lives that lets them thrive. Regardless of how and when you do your planning and purchasing, I thought it might be helpful to pull my notes together in case anything might spark with you. 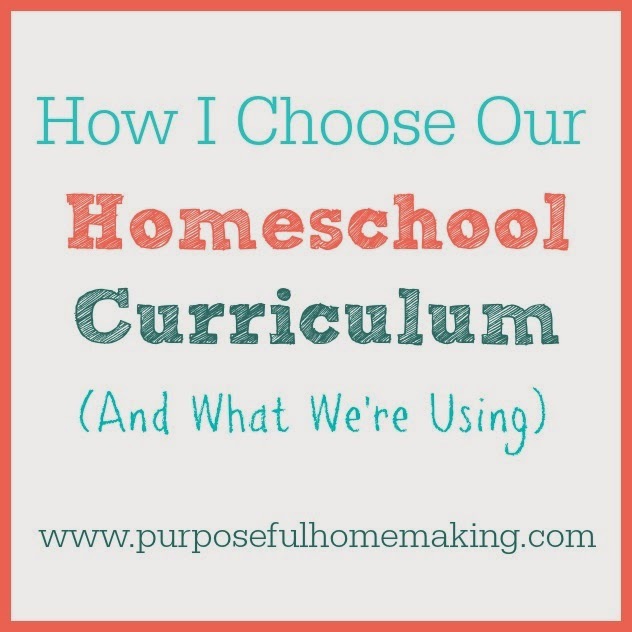 My friend and I are meeting this week to go over curriculum for the fall so I figure if we like to get it figured out ahead of time there must be other Mommas that feel the same way we do so I hope this post will help you as you make your decisions. What Resources Do I Use to Help Me Plan? Since I was new to the idea of branching out on my own, I found several resources to be very helpful to me. Probably the most influential one came from Dollie Freeman's ebook, The Charlotte Mason Way Explained. I came across this book in last years Ultimate Homemaking Bundle Sale and it really resonated with me. This was the seed that was planted in my heart to help me start thinking about other homeschooling approaches the Lord might want me to consider. Since I settled on somewhat of a Charlotte Mason approach along with a twist of eclectic choices just because I like the freedom of choosing what we want to study, another fabulous resource was A Charlotte Mason Companion. Initially I checked this out at our library, but quickly realized this was a resource I wanted to continue to have on hand so then purchased it on Amazon. What I found to be the most helpful when trying to decide what to study was first determining what we wanted to study for each subject. For science, I chose a particular unit of study based on one of our children's current interests. For history I chose a time period that I wanted to be sure to cover in depth with our children. For Bible I chose what was important to me that our children learn. I think you get the idea. Then I began looking through numerous curriculum catalogs, found the subject or time period we were interested in and then began to pick and choose the books I thought would be the best fit for us. For each of these I found it easier to request a print catalog so I could go through and mark what I was interested in and compare prices. AWANA: Our church does AWANA which is predominately a Bible memorization program for children ages 3-6th grade. Time will be set aside each day to work on that week's sections. Apologia: For the last couple of years we have slowly been working our way through Apologia's Biblical Worldview Series and it is phenomenal. We will continue to work through these. Quiet Time: I want to encourage each of our children to have their own Quiet Time with the Lord. Prior to me making our own schedule this was something we had to add on to our daily schedule. That meant some days it just didn't get done. I don't like that and I would prefer to weave our normal living into our homeschooling as much as possible. Adding it to our schedule will guarantee I am reminded every day to make this a priority and Lord-willing, it will be. Plus, this will give me some time of my own to prepare my heart with the Lord for the new day. Our oldest is finishing up the last book in Righstart Math so will be moving into Saxon Math. This was new territory for me, but a veteran homeschooling mom recommended Saxon Math as a great transition from Righstart Math and after talking with a very helpful lady at Rainbow Resource I was able to decide that this is the next step for him to take. I stared using Spelling Power with our current 4th grader and it is great. I have used several spelling programs over the years and we are planning to stick with this one. Our upcoming 5th and 3rd graders will be using this. My 1st grader won't be doing spelling 1st semester but in the 2nd semester I plan to start with Spelling You See. Our oldest two are currently using Pathway Readers and I cannot recommend these enough! They skillfully weave character qualities, real life decisions and science into these stories. Plus, you can't beat the price! Our Kindergartner has done really well with the Bob Books, but when he's ready to start Pathway Readers I'll transition him into those. Independent Work will include Handwriting, Latin, Typing and Poem/Scripture Memory work. We'll be incorporating a lot of oral narration (a Charlotte Mason approach) as well as some copywork. Initially I'll be using Phoebe the Spy to do some of our oral narration and writing from. I'm also planning to dabble a bit in Writing with Ease with the older two with a strong focus on oral narration for our younger one. We are so excited about this subject! Our main book will be Exploring Creation with Human Anatomy and Physiology (awesome book!) from Apologia. I also discovered the accompanying science kit that provides you with almost everything you need for all of the experiments throughout this book. Definitely worth getting in my opinion! To go along with our study on anatomy I bought the Somebody Board Game which the kids have already been using (and love!). We also have the Melissa and Doug Human Anatomy Floor Puzzle as well as the Uncover the Human Body 3D book. Those last two items I picked up at garage sales and I think they are what sparked a deeper interest in human anatomy which is why we went that route for the upcoming school year. I also picked up The Electrifying Nervous System when I ordered some things from Answers in Genesis and it is excellent! We'll also be doing nature walks and I bought each of the kids their own spiral bound sketchbook. Another subject we're very excited about! We will use America from the Beginning from Answers in Genesis as our main book over the course of the next two years because I am choosing to focus on a certain time period in American History. This will allow us to study this particular time period more in depth by incorporating a few other books as well as some great chapter books. To supplement our study we are using several books throughout the year including Exploring American History, Children's Encyclopedia of American History, For You They Signed and The Landmark of American History. Plus, I picked several other books for our read aloud time. Some of them include: Rush Revere and the American Revolution, Samuel Eaton's Day, The Pilgrims of Plimouth, Sarah Morton's Day, A Lion to Guard Us, The Matchlock Gun, Courage of Sarah Noble. Currently our children take a music class at our local Christian school. Depending on the schedule we may or may not be able to continue that in the fall. I have scheduled in listening to Classical Music during our Read Aloud time and Lord-willing the older two will continue their piano lessons. If I can ever find my One Year Book of Hymns I would like to use that this year as well. Most of the books for our Read Aloud time will I already mentioned under our History section. This is for the benefit of all of us but I'm the one that needs the daily reminder! I don't do exercise videos but I have been known to use the Wii Fit on occasion. If the weather's nice, we'll be taking walks or hikes. This is our Drop Everything and Read time. Our children already love books and I want to make this a peaceful part of our routine each day. It is a nice 15 minutes cuddled up with a good book. I guess that about sums up what we're doing. I'm sure there are going to be a few tweeks here and there but this will give you the gist of it. I get restless in about February and start looking for new curriculum items to use for the fall, but now that I have my second student coming up, I'm mostly reusing what I have (Sonlight, Apologia and some eclectic items for the other subjects). It's nice not to have to worry about getting MORE stuff!